So when Matt made Challah a couple weekends ago, the leftover loaf sat on our counter among other homemade rolls he made. We ate the rolls, but the Challah just sat there, threatening to mold. So I stuck it in the fridge to prolong its life and waited for the weekend. Saturday rolled around and I turned that almost-moldy bread into amazing French toast. Cinnamon, vanilla bean, a touch of almond extract made the batter extra decadent. I pan fried some bananas and almond slices in a touch of butter and agave nectar and sprinkled them on top. It was so good and once again, I got the satisfaction of knowing I didn’t let Matt’s bread go to waste! *Give yourself a 30 minute head start so the bread can soak! Heat your oven to 200F. Whisk the eggs, milk, cinnamon and extracts together and pour into a 9×13″ pan. Arrange the bread till it fills the pan and let it soak on one side for 15 minutes, then flip and let it soak for another 15 minutes, pressing down to soak up more batter. Heat a large non-stick skillet or griddle over medium heat and add butter. When butter starts to bubble, add the slices of bread (work in batches) and cook till golden brown on each side, about 5 minutes per side. As they finish, put them on a baking sheet and place in the oven to keep warm while you finish the rest. When you’re done with the toast, wipe the skillet out with a few paper towels and over medium high heat, toast the almonds until brown and fragrant. Remove and add one tablespoon of butter, a swirl of syrup and the bananas and cook until golden on each side, about 1-2 minutes per side. 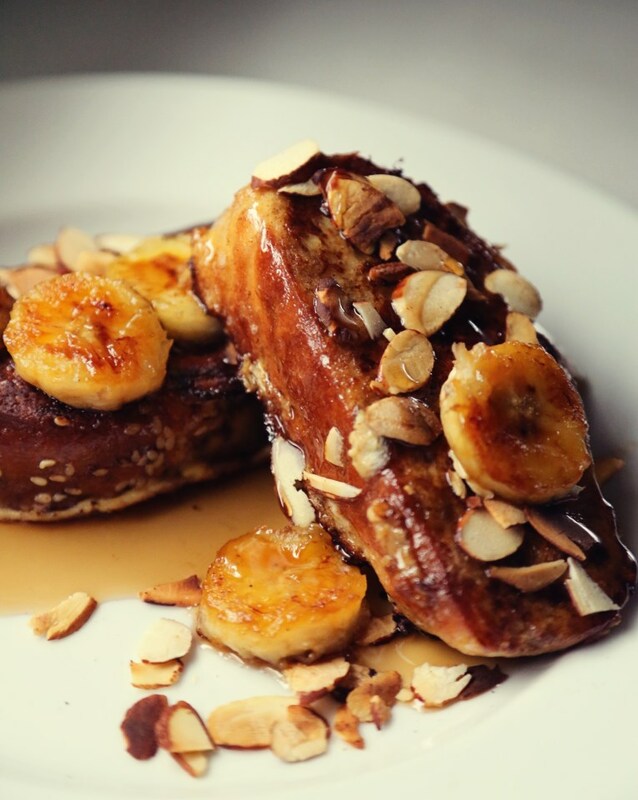 Top the toast with almonds and bananas and syrup and serve! A new bakery opened in town a while ago and I was excited to check it out, because I had heard they had “fresh baked bread.” You’d think that would be common (or even implied) for bakeries, but it seems “bakery” has become synonymous with “cakery” these days. When we visited, I found they indeed did have fresh baked bread: banana bread, corn bread, and other technically-classified-as-bread baked items I can’t remember. I like banana bread, but I think it’s a little misleading to just call it “bread.” Bread is flour, water, salt, and yeast – “the staff of life.” Banana bread is not “bread,” it’s “banana bread.” It’s like how Elvis is Elvis, and Elvis Costello is Elvis Costello. That’s not to say all enriched doughs are inferior – a good brioche is almost as much a work of art as a great baguette. 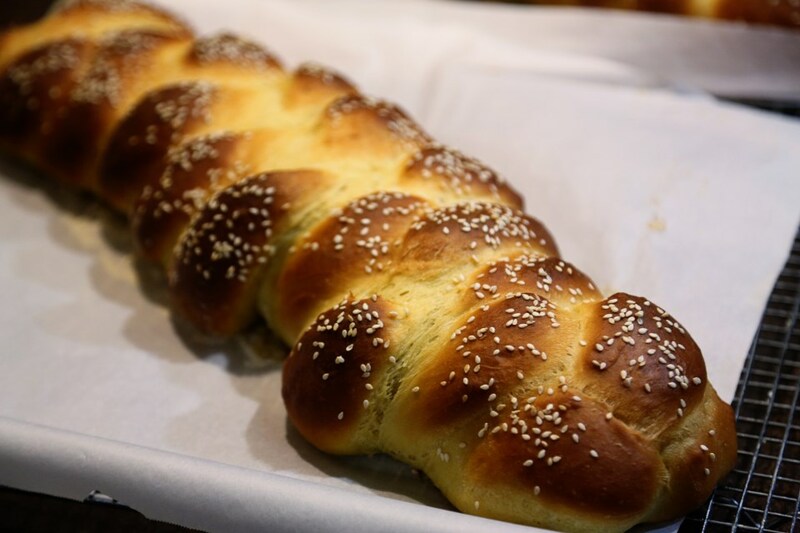 My favorite enriched bread to make though, is challah. 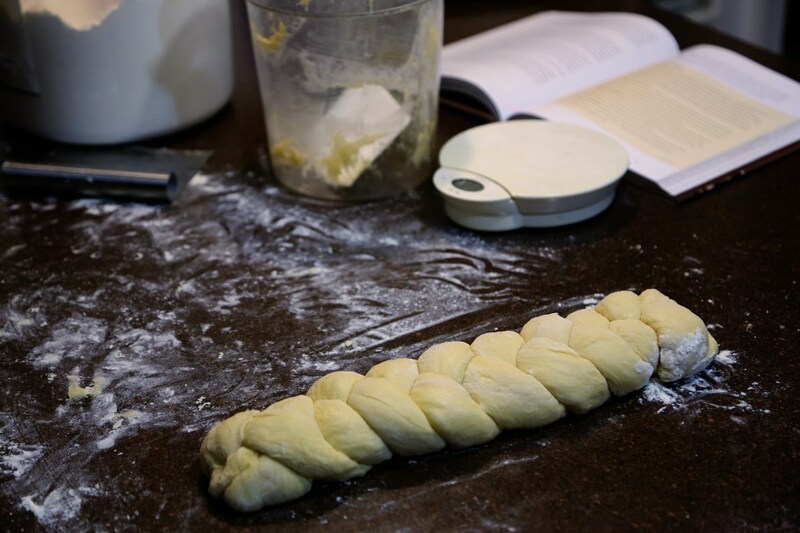 It’s easy to work with, fun to braid in all sorts of different ways, and the color is amazing, with a creamy yellow crumb and a rich brown crust. 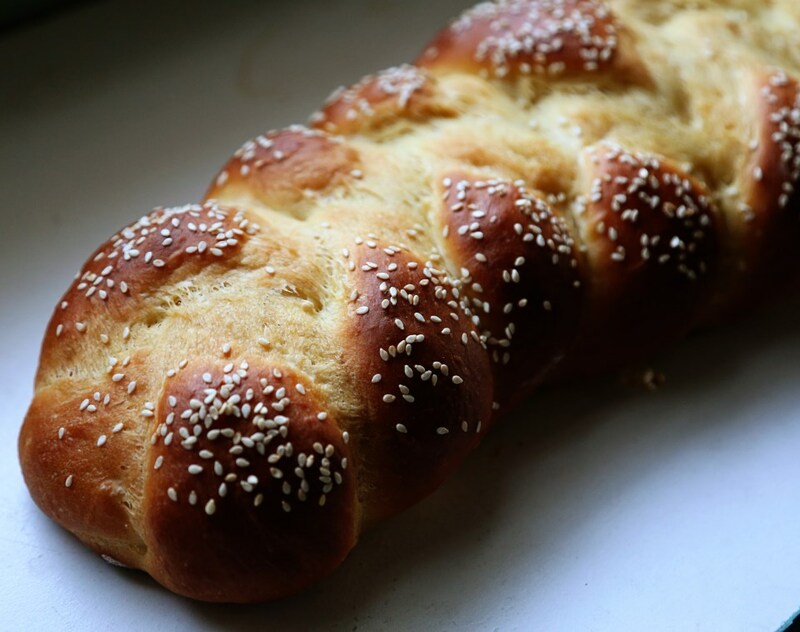 Challah is traditionally a Jewish Sabbath bread, and I think it’s a great weekend activity. 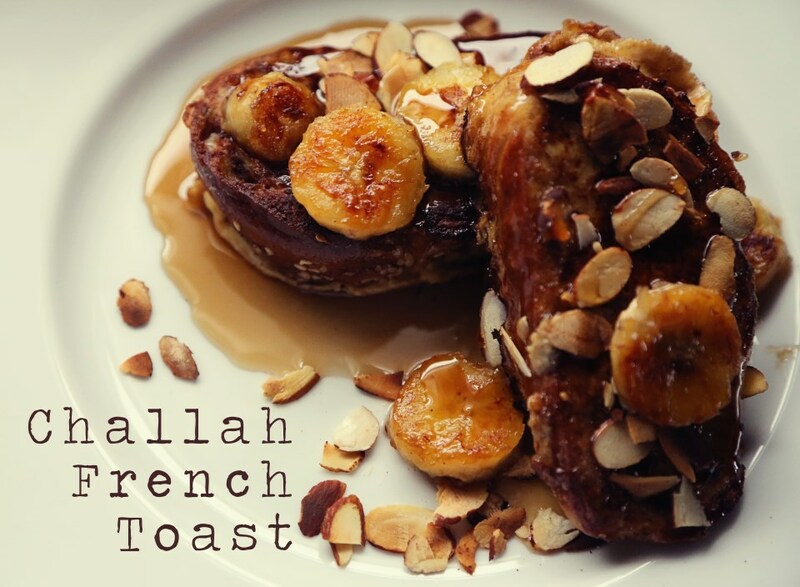 You can have a great loaf of bread in just a few hours on Saturday and turn the leftovers into French toast for Sunday brunch. I followed the recipe from Peter Reinhart and will post pretty much directly from Michael Ruhlman’s blog when he did the hard work and wrote out the recipe for me. Combine the water and the yeast in a mixing bowl or the bowl of a 5-quart mixer and whisk together to dissolve. Add the egg yolks, oil, sugar, and vanilla, if using, and whisk together to break up then add the flour and salt. Using the paddle attachment, mix the dough for 2 minutes on the lowest speed. Let the dough rest for 5 minutes. Switch to the dough hook and mix on medium low for 4 minutes. Use a floured bowl scraper or floured hands to transfer the dough to a lightly floured surface, sprinkle the top lightly with flour and knead by hand for a couple of minutes until the dough is soft and supple. It should be tacky but not sticky. Place the dough in a lightly oiled bowl, or divide the dough in half or in as many portions as you plan to bake, and place in oiled bowls. Cover and immediately place in the refrigerator. The dough should rest at least overnight and can be kept refrigerated for up to 4 days. Remove the dough from the fridge approximately 2 hours before you plan to bake. 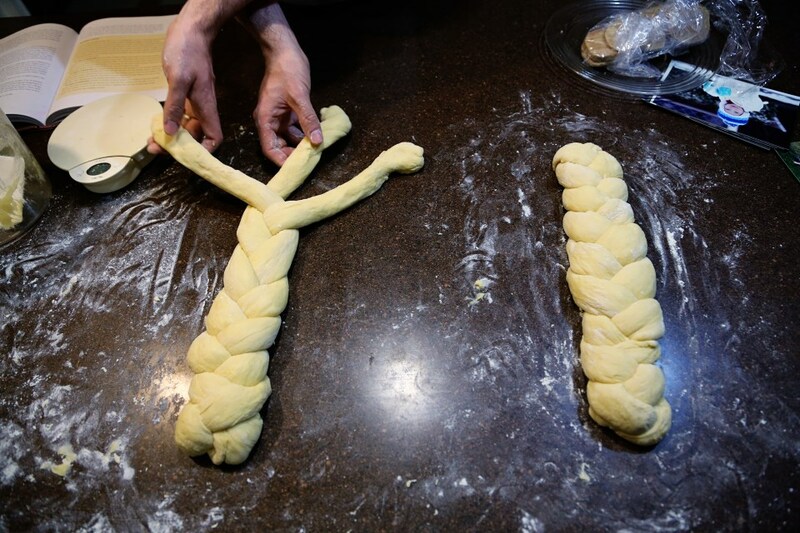 Transfer it to a lightly floured surface and cut it into the desired number of braids you want to use or shape into loaves, or dinner rolls. 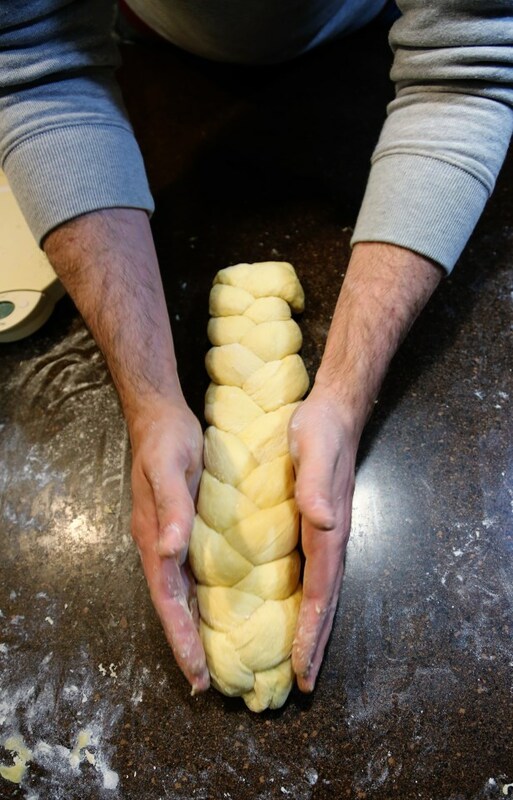 If you are braiding, flatten each piece with your hand, then roll into cigar shaped lengths. Roll each piece once, then return to the first piece to roll it into a rope approximately 10 to 14 inches/25-36 centimeters long. Make sure it will fit on your baking sheet! Roll each piece to the same length then braid. Place the loaves on sheet pans lined with parchment paper. Make the egg wash and brush each loaf with the wash. Reserve the rest of the wash in the fridge, and let the loaves rise uncovered for about an hour. They will not have risen much at this point. Brush the loaves again with the egg wash and sprinkle with poppy seeds or sesame seeds or a combination of both. Let the loaves rise for another hour until they increase to about 1 ½ times their size. 15 minutes before baking, pre-heat the oven to 350 degrees F./177 degrees C. or 300 degrees F./149 degrees C. for convection. Bake for 20 minutes, then rotate the pan and bake for another 15 to 30 minutes, until the loaves sound hollow when thumped on the bottom and the internal temp is around 190 degrees F./88 degrees C. in the center. If you used a whole egg wash, the crust will get darker than with the egg white wash, so don’t be fooled into thinking the bread is done until it passes the thump and temperature test. Cool on a wire rack for at least 45 minutes before slicing and serving.